In humans, we all know that aspirin is a very well-known pain reliever and an anti-clogging medicine that is relatively used by a lot of people all over the world. However, no matter how safe it is for humans, your fur babies should not take such kind of medicine without your veterinarian’s prescription as your pets may be exposed to high risks of bleeding. It is true that your dogs might experience pain and inflammation for several reasons, but don’t give it over-the-counter medicines intended for human consumption, and if you see the need for your pet to take-in aspirin, it’s about time you learn what is buffered aspirin. Buffered aspirin is a kind of medication that is safe for your four-legged buddy to take-in. This medicine is coated with a neutralizing acid substance that can ease the pain that your dog may be feeling. Buffered aspirin for dogs are also used to prevent inflammation and as analgesic. This kind of aspirin is made with salicylic acid which you can get from myrtle bushes, birch and willow trees. When Should My Dog Take Buffered Aspirin? There are several reasons why your veterinarian might prescribe the use of buffered aspirin for your dog. According to Anna Burke of the American Kennel Club, the most common reason behind buffered aspirin prescription is when dogs experience osteoarthritis or inflammation in the musculoskeletal system. These illnesses causes great pain in your pets and the use of buffered aspirin helps reduce the inflammation that is caused by these medical conditions so your dog can experience some relief from pain. Remember, no matter how much you want to help your dog ease the pain that they feel, you should not give them aspirin without the veterinarian’s prescription to avoid further damage in your pet. What are The Best Buffered Aspirin Out In The Market? There are a lot of options to choose from when buying a buffered aspirin for your pets. However, before you decide which to purchase, you should first seek professional help in order for you to give your dog the right kind of buffered aspirin it needs. 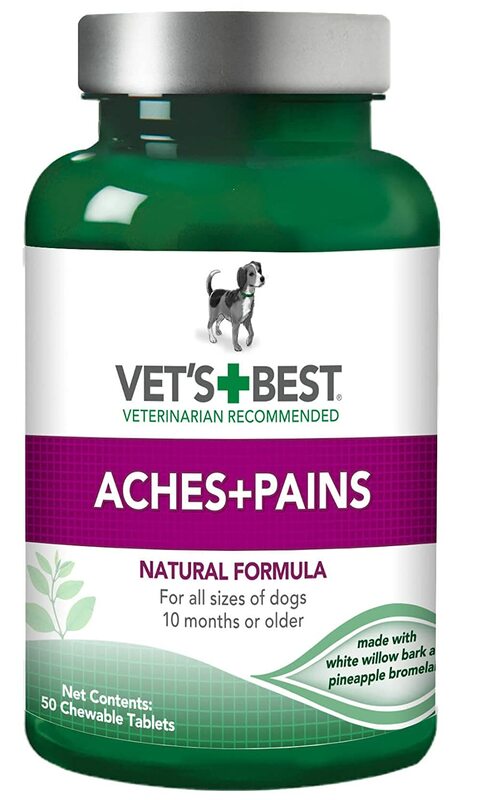 One of the best products in the market that has a lot of positive reviews from consumers is the Vet's Best Aspirin Free Aches & Pains Dog Supplements. Reviews say that it is one of the best buffered aspirin that can cure osteoarthritis and musculoskeletal inflammation. There is also the Excel Aspirin for Dogs which does pretty much the same and also is proven to be safe and effective for your dogs. While these medicine recommendations may work in some dogs, it is always best for you to assess the situation of your pet and ask your vet about it. Technically speaking, if your vet prescribes buffered aspirin for your dog, then you’re assured that it is safe to do so. However, you should follow the advice of the veterinarian very meticulously. There are a lot of reported cases when dogs experience adverse effects of buffered aspirin, so in the event that you’re giving your pet this medicine, you should be keen in observing these possible symptoms of overdosage or adverse reactions. If you see any of these signs, stop giving the medicine to your pet immediately and bring it to the vet. Always monitor your dog’s behavior when in contact with any medicine to ensure their safety. The least that you’d want to experience is your dog’s death while trying to heal it through medicine administration. Buffered aspirin should be taken by pets with meals because it can be the cause of ulcers if your pet takes it on an empty stomach. Check for allergic reaction the first time your dog takes in the medicine and remember to check other medicines that your dog is taking because buffered aspirin should never be mixed with codeine and acetaminophen as it may result to death. If your pet already has stomach ulcer, asthma or kidney problems, don’t give it this medicine. Pregnant and lactating dogs should also not be given buffered aspirin. Discuss the pros and cons of using the medicine as per your pet’s situation with your vet. It is the best practice you can do. Take a little time to read and do research on your own before you administer buffered aspirin to your dogs so you can save yourself from the agony of seeing your dog in bigger trouble. You are now much aware of the risks and effects that may be associated with buffered aspirin intake, you should see to it that you administer the proper dosage as advised by your veterinarian to your dog baby. This article is not a substitute for your vet’s advice so still, the best way to ensure your pet’s safety is by seeing a vet first before you give it buffered aspirin. If you have any inquiries regarding the medicine, seek professional help.